This was my first experience at a Brew Bracket event, and based on how much fun I had, it won't be my last. For those of you who haven't been, here's the concept: local brewers compete in a blind taste test set up in a classic tournament style. Tasting happens two beers at a time and the winners of the first round go on to compete in the next round, and so on, until the top two beers as voted by the attendees go head to head in a final round to determine the overall winner. I liked the fact that it was a blind taste test. I definitely have preconceived notions about which brewers do things better, or more in a style that I like, so this way I was able to eliminate those biases. I'm sure I'm not the only one who has that. Plus it was fun to see if you could guess the winner, or guess which beer came from which brewery. For the record, I was way off on all counts. The event that I went to (translation: that the guys let me tag along to) was all about Belgians. I like a nice Belgian. I find them to be complex enough to be interesting with a variety of flavors and styles that I enjoy. I'm not a big fan of anything really hoppy, so this style overall is more in line with my preferences. 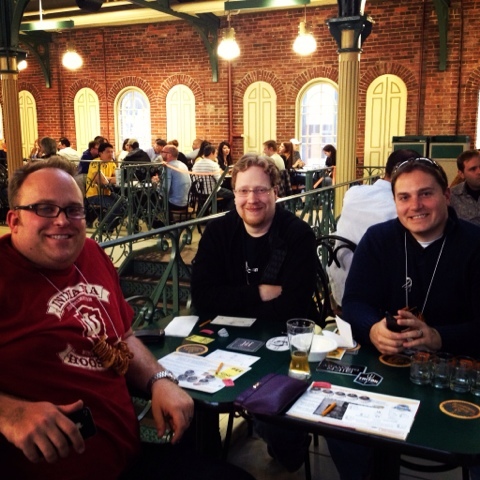 It was held at the Tomlinson Tap Room in the City Market in downtown Indy. Great location. I've been there once before, and I really like it. I'd have liked it if more of the restaurant vendors had chosen to remain open, but the pizza was really good. The fact that we had pizza sometime between rounds 6 and 7 had nothing to do with that I'm sure. Because of the location, this event was a bit smaller than the ones they hold at the state fairgrounds (150 people instead of 400), and we were served rather than going to different stations. 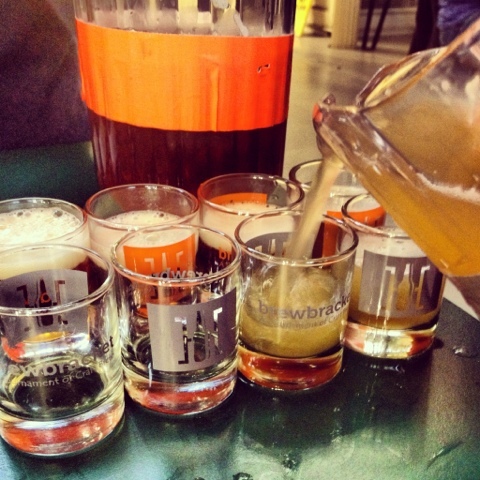 Event Tip: Make it easy for your server to pour the beer by lining up your tasting glasses. You just might get a little extra beer that way. All great in their own way, but it was Twisted Crew's Frothy Mothy that wound up with the winner's title. My picks were Triton and Bloomington. Both had a bit more of a citrus profile than the others, which tasted summery and refreshing. To see how this event compares to the first Brew Bracket event the Beer Barons attended, check out O-Dawg's post on Ambergeddon. West (Round 2) Bier Brewery's "Belgian Trippelle"
East (Round 3) Twisted Crew Brewing Company's "Frothy Mothy"
Trying to decide the winner in the final round was very hard. Bloomington Brewing Company- "Biere de Mars" was a nice light and spicy Belgian and Twisted Crew Brewing Company's "Frothy Mothy" was very similar but had an odd hit on the back of the pallet on its finish that in the end made me vote for the runner up. Liked the more personal touch of the smaller venue as a change up. We had the same Beer Slinger (Tara, thank you again!) for the entirety of the event. 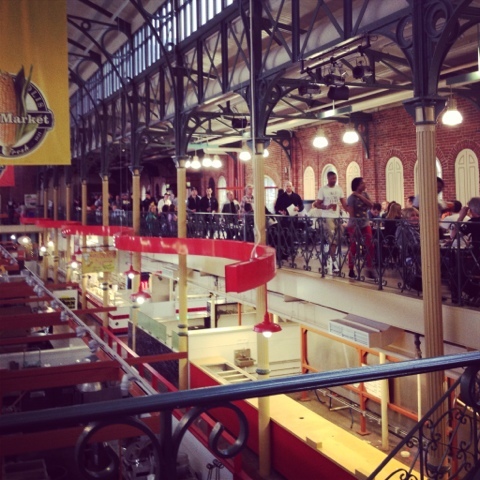 Missed Der Pretzel Wagen! That and the variety of vendors at previous events. Mauricio's Pizzeria was good, but it was the only option. Spontaneity of conversations sparked by the beer and varying proximity to random people to chime in or offer counter points. I'm social, what can I say? You just don'g get that kind of interaction with the table service environment. Everyone is usually knee deep in their own conversations/phones with friends at their respective tables to be bothered with more random face to face social engagement with others after standing in line/bumping into others. All in all it was great and looking forward to the Pale Ales! Congrats again to Twisted Crew Brewing Company! My bad, totally missed the deadline for this post. I loved the BBBelgians. It was a ton of fun and we got to have some really good beer. The Tomlinson Taproom was great. Their was more room than I expected and service was great. There could have been more food, but the best thing was there were beers on the side. I felt like I was back in college again, always having a "side arm". I totally fell in love with Imperial Breakfast Magpie by New Day Meadery. Not always a huge mead fan, but this was outstanding. It was a great night with great friends. I have already gotten my VIP tickets to the Pale Ale event coming up at the fair grounds. You should come too.